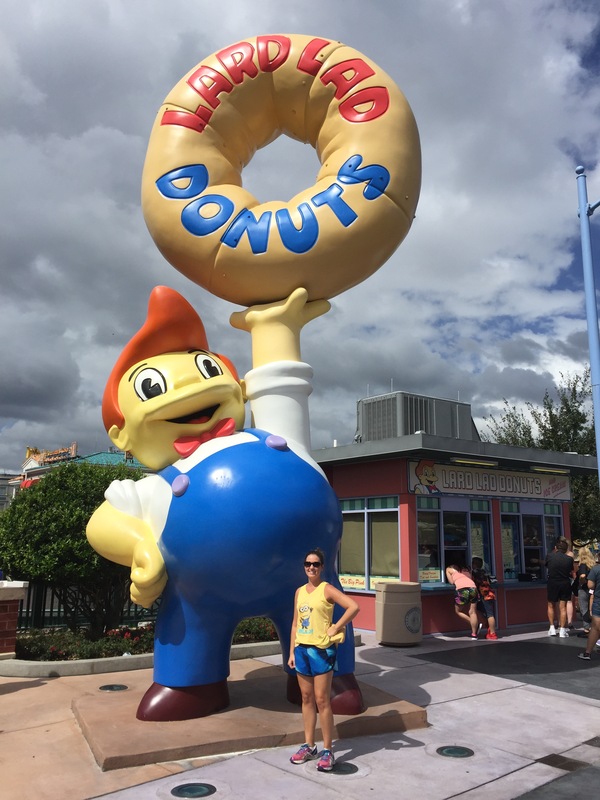 donut sundae – Biscotti and a Ph.D.
Based on my crowd calendar research, Wednesday was supposed to be a low-crowd day at Universal Studios and Islands of Adventure. That wasn’t quite accurate. October must be a prime vacation time for Europeans? Anyway. It was crowded, and we had a blast nevertheless. During October, Universal has Halloween Horror Nights which looks terrifying. They actually just released the dates for 2017, so if you’re into that thing, you can start planning! American Horror Story will be one theme according to their website. Since that was going on while we were there, Universal was closing early which is why we chose to do that park first. 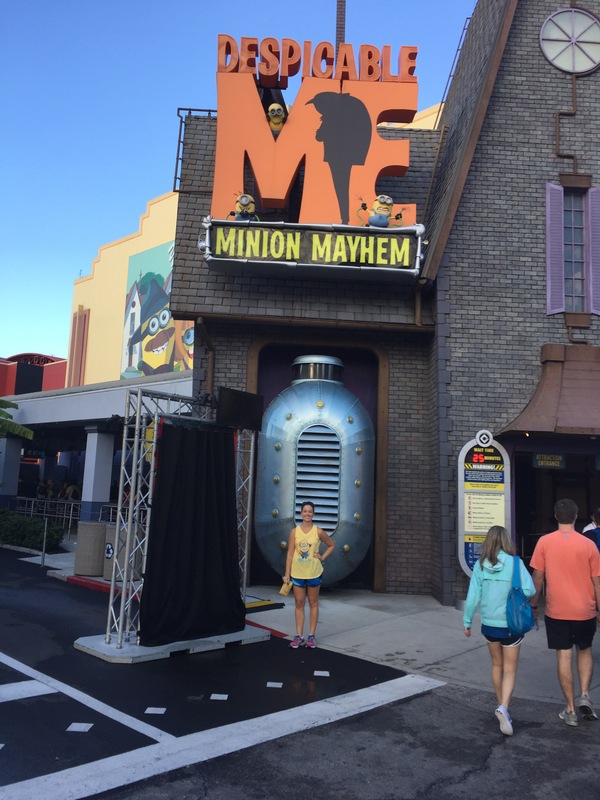 We arrived right before the park opened and made a beeline for the Despicable Me ride since it’s at the front of the park. Boyfriend loved that one. Shrek wasn’t working, and we passed by it several times to check throughout the day with no luck. The Hollywood Rip Ride Rockit rollercoaster was supposed to be next; I wasn’t able to get up the nerve for that one and when I had finally decided to be brave, it was also having technical problems. This gal doesn’t get on things that fling her through the air if she knows it hasn’t been working, so we had to cross that off our list, too. I felt guilty but also super relieved! 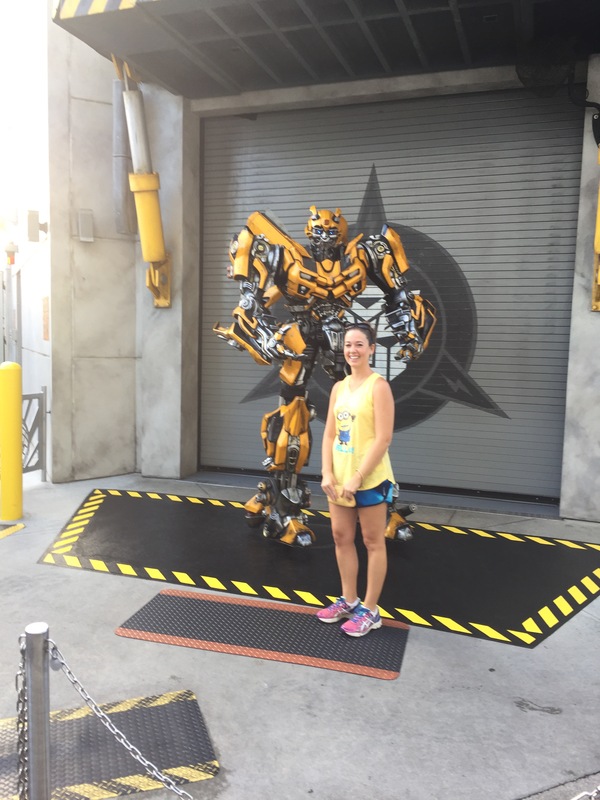 I made a quick pose with Bumblebee on our way to the Transformers ride (that line also went quickly). Boyfriend really likes Transformers but didn’t seem to enjoy the ride as much as I did. It’s been years since I’ve been to Universal; I loved how the rides now have a combo of 3-D with actual movement (the website describes them as 3-D/4-D experiences, but rather than being in a seat the car moves through the building to different screens – do I sound old being in awe of this?). 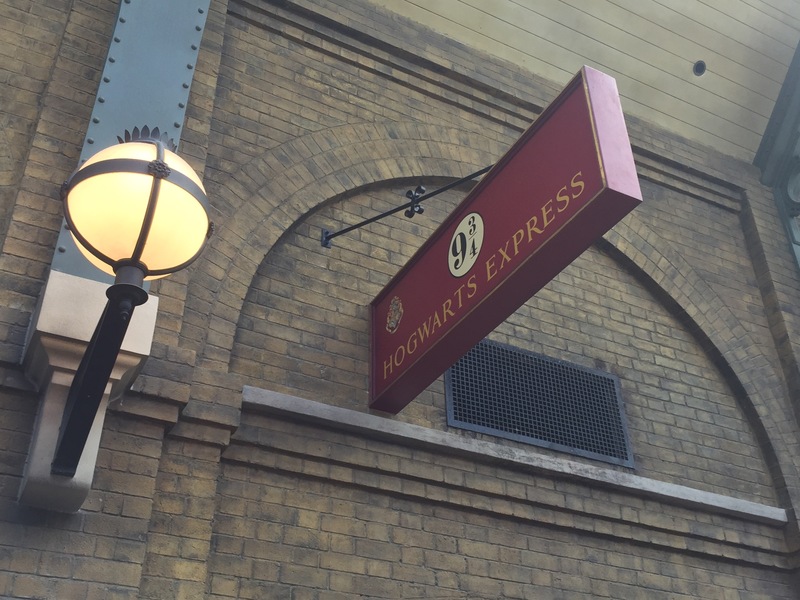 Our next stop was The Wizarding World of Harry Potter – Diagon Alley! This area is hidden behind a brick wall, and if we hadn’t seen people walking through the narrow entry, we would’ve walked right on by. Despite being a book nerd, I resisted the Harry Potter mania when it first happened, but boyfriend made me watch all the movies before our trip (and I’m so glad I did!). 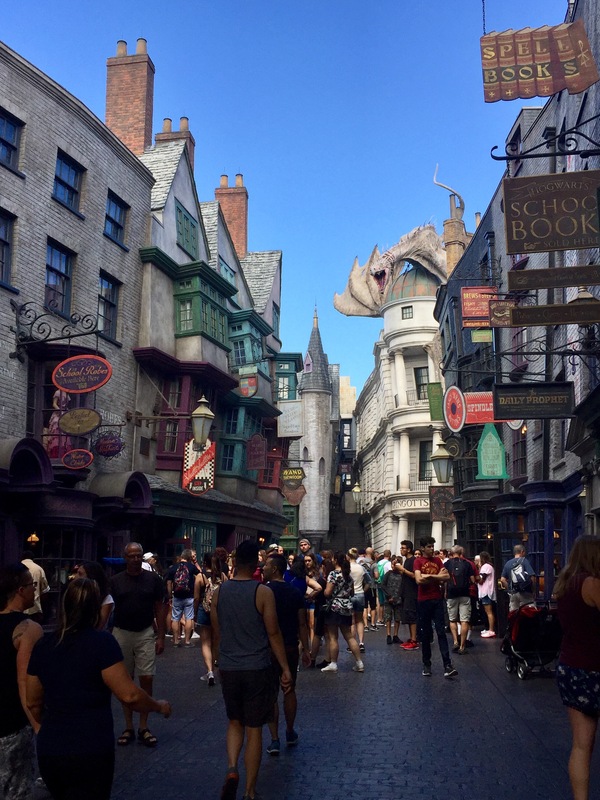 Be sure to take some time to walk through the shops and find the hidden alleys…and definitely watch out for random spurts of water from people testing out their wizard wands. The Escape from Gringotts was such a fun ride! We didn’t have a terrible wait (30 minutes? ), but the building/atmosphere is so amazingly impressive that waiting in line actually provides opportunities to take everything in and snap a few pictures! I was too busy looking to get pictures, but I can’t imagine that pictures do justice to actually being there. Lunchtime! I probably looked at the menus for every restaurant/food spot multiple times (this is no surprise to those who know me well). Unfortunately, I don’t think Universal has the same level of dining as Disney parks. We ended up splitting a burger and fries at Krusty Burger in The Simpsons area. It was fine, but I really can’t remember anything about it. HOWEVER, ya see that little building behind me in the picture above? 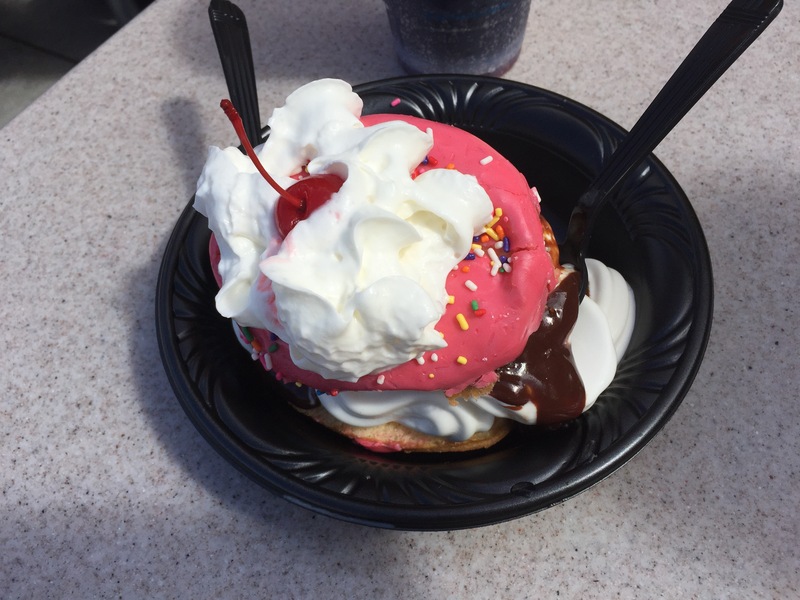 Lard Lad Donuts is where the magic happens – the donut sundae (cue the angel choir). You know that feeling when you find the Holy Grail of food and the crowd parts while everybody stares at you with admiration and jealousy? Yeah, that happened. You need a donut sundae. If you’re with somebody who doesn’t want a donut sundae, get one anyway (and maybe get rid of that person because who needs that kind of negativity??). After our donut delight, we opted to separate for The Simpsons ride and both got in the single rider line to cut down our wait. If you don’t mind doing that you can get through some of the longer lines a little quicker. We followed that with Men In Black Alien Attack (I get super competitive at shooter rides) and ended up waiting at the end because the ride broke (that seemed to be a theme for the day?) and then E.T. Adventure, which is cute but extremely outdated. I’ll be anxious to see how much longer that one lasts. If you’re short on time and have rides that are high on your must-do list, I recommend leaving this one out. At this point we were ready to take the Hogwarts Express over to Islands of Adventure. The line for the train took quite a while, and it probably would’ve taken a lot less time to just walk, but we had to ride it at least once! Although we missed/skipped a couple rides and didn’t go to any shows, it was a successful 1/2 day at Universal. 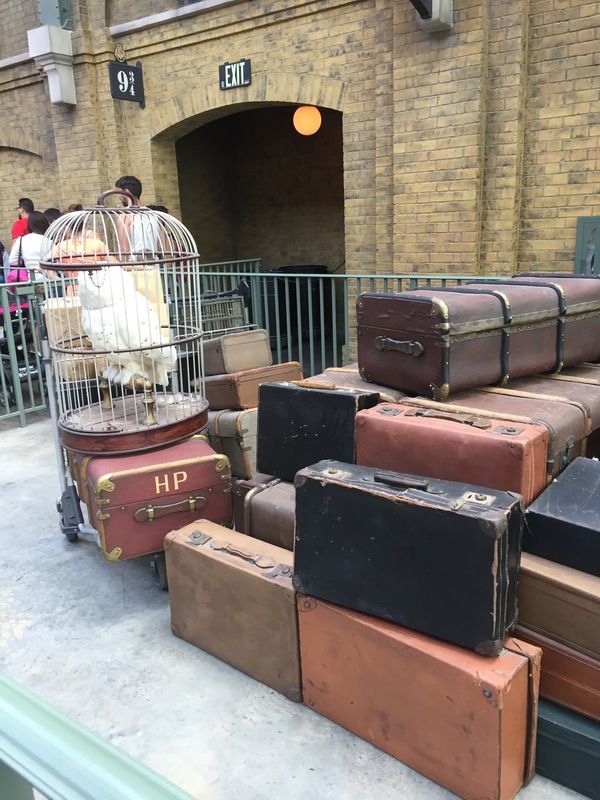 Stay tuned for Part 2 at Islands of Adventure, ya muggles!